A fuel card is a credit card most commonly used to buy gasoline, diesel, and other fuels at gas stations. It can help business owners manage their company vehicles and provide online expense tracking, discounts, and rewards. The best business fuel card for small business options offer affordable fees, low APRs, and wide network availability. Business owners can also use a traditional small business credit card for their fuel expenses. For example, the Chase Ink Business CashSM gives business owners the ability to issue employee cards and set spending limits on those cards. There is also a sign up bonus of $500 when you spend $3,000 in the first three months, and you can earn up to 5% cash back beyond that reward. The six fuel cards for small business we evaluated all offer different benefits to small business owners for gas-related expenses. Most business gas cards have a variety of rewards and a range of APRs and fees. The best business gas card for your business is likely determined by the card’s cost, networking availability, and possible discounts or cash-back rewards you can receive on gas purchases. After taking these different factors into consideration, we recommend the Shell Small Business Fuel Card as the best business gas card because of its network availability and inexpensive monthly fees. It’s also the most flexible fuel card that provides discounts at several locations nationwide. The Shell Small Business Fuel Card is the best fuel card for small business because of its choices for liability, its overall network availability, and its low fees. This card has no monthly setup fee or additional card fee and has a regular APR of 23%. In comparison to other cards on our list, they charge an account and card fee. This is also an excellent option for business owners looking to have a rewards program that is accepted at the most amount of locations (14,000). Most fuel cards generally don’t carry no-interest periods, much like the Shell Small Business Fuel Card. Instead, cardholders will have a fixed APR of 23% from the moment they open their account. Although this is the same for the other credit cards on our list, the Shell Small Business Fuel Card gives users access to the widest range of stations at which to earn rewards. Keep in mind that only credit cards will carry a regular APR. In comparison, fuel charge cards won’t have an interest rate because they are required to be paid in full every month. Instead, they have late fees. Some fuel cards, similar to small business credit cards, carry fees including a monthly fee or cost for additional cards. However, Shell’s fuel card tends to be one of the most affordable options, with no monthly or additional card fee. This means you can pass out as many cards as you’d like to your employees at no additional charge. When you first open your corporate account, you can request up to 14 employee cards. After you’ve been approved, you can request as many cards as you need at no additional charge. If you do decide to request additional employee cards, it’s worth having a corporate credit card policy to help set expectations and protect yourself. The Shell Small Business Fuel Card works like a traditional business credit card, which means it’s expected to be repaid on a monthly basis. Although it’s recommended to pay your balance in full, it’s not required, like it is with a charge card. Instead, you can pay the monthly minimum requirement. With this card, that is $20 or 2.5% of the total balance, whichever is greater. The Shell Small Business Fuels Card offers a straightforward $0.03 cash discount on a gallon of gas purchased at one of Shell’s 14,000 locations. In comparison, the 76 Universal Fuel Card, which is also on our best fuel card list, only offers rewards at 7,600 participating locations. Shell’s 14,000 locations that participate in their rewards program is the most on our list. The card can be used for vehicle-related purchases at participating Shell locations, but no other discounts are offered. The only reward you can receive is the flat discount on gas, which is currently $0.03 per gallon. The Shell fuel card has two ways to qualify, which is uncommon and is one reason why it’s the best business gas card. The first way is through a typical joint application, where the credit score of both the owner and the company are checked for approval. The second is through a company-only application, which protects the owner’s personal credit score and personal assets. If you choose joint liability, your personal credit score is used to qualify you for your card. While the card won’t appear on your personal credit report, you will still be held personally liable for the account with the business, as you’ll be required to offer a personal guarantee. This means you agree to repay the debt personally if the business fails to do so. In contrast, choosing company liability is a good option if you want to protect your personal credit score and personal assets. In addition to your personal credit score not being used to qualify, the provider won’t require a personal guarantee from the business owner. When considering the best fleet fuel cards, it’s important to consider where the cards are accepted. Generally, fuel cards work at participating locations only. For example, the Shell Small Business Fuel Card can only be used at Shell gas stations. Shell has roughly 14,000 gas stations available nationally and their fuel card receives a discount at all of them. However, this is lower than some cards; the 76 Universal Fuel Card, for example, is accepted at 45,000 gas stations nationally. The Shell fuel card doesn’t provide the best rewards and discounts as some of the other fuel cards, which provide discounts up to $0.06 per gallon. However, we still recommend this as the best because it has the most locations that participate in a rewards program (14,000). This is roughly double what the 76 Universal Fuel Card offers. Online reviews of the Shell Small Business Fuel Card are excellent. 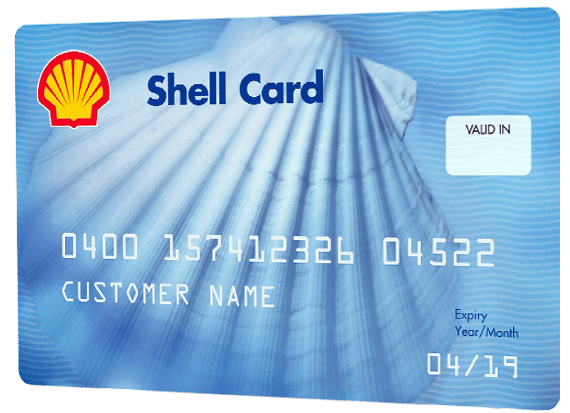 Cardholders especially like that Shell has a wide network availability and that every location participates in the rewards program. Also, a discount on every gallon is a plus to those who have this fuel card. The only negative review we found online suggests that even though it’s accepted at 14,000 Shell locations, this card can’t be used at non-branded gas stations. You can apply online for the Shell Small Business Fuel Card by filling out a basic application containing both business and personal information (depending on if you apply jointly or as a company). You can be approved and receive your card in the mail within seven to 10 days. The 76 Universal Fuel Card is best for flexible spending on gas because it’s accepted at a wide variety of national gas stations. There are roughly 45,000 stations that accept this fuel card, but rewards only work at participating 76, Conoco, and Phillips 66 gas stations. Similar to the Shell Small Business Fuel Card, it doesn’t offer a no-interest period and has an ongoing APR of 23%. This is an excellent option for businesses that don’t want to be limited to a specific gas company or station. Similar to the Shell Small Business Fuel Card, the 76 Universal Fuel Card doesn’t offer a no-interest introductory period and has the same ongoing fixed APR of 23%. 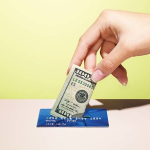 This also acts like a credit card—not a charge card—so interest applies to any unpaid balances instead of a late fee. The 76 Universal Card is one of the few fuel cards that actually carries a monthly, recurring card fee. The 76 Universal Card has a $2 monthly fee per card, which is paid for by the company (the Shell fuel card that has no setup fee or monthly card fee). In addition, the 76 Universal Fuel Card also currently charges a one-time $40 account setup fee when you apply. There is no charge for new cards, but there are other fuel cards on our list with more affordable fee structures. The 76 Universal Fuel Card’s payment terms are net-30, with a monthly minimum payment of $20 or 2.5% of the total balance, whichever is greater. Net-30 means that your credit card bill is due on or before the 30th day of the month. Since this works like a credit card, any unpaid balances that carry over to the following billing cycle will accrue interest until they are paid off. 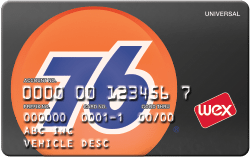 The 76 Universal Fuel Card offers several levels of discounts at 7,600 participating gas stations. The discounts are valid at any 76, Conoco, and Phillips 66 location. Rewards are based on a tiered structure of monthly gallon usage, and they range from $0.01 to $0.04 per gallon. Remember that the even though the 76 Universal Card is accepted by 45,000 gas stations, only about 7,600 of those locations participate in its reward program. This means that you can only earn, as well as use, the card’s gas discounts at select locations. Conversely, the Shell Small Business Fuel Card offers rewards and discounts at all of their 14,000 national gas stations. The 76 Universal Card requires the joint qualification of the business and the business owner. A personal credit score of 640+ and a good business credit rating (check yours for free) is required to qualify. The card doesn’t show up on the business owner’s personal credit, but they’re held liable for the credit card bill, which includes any fees or delinquent payments. The 76 Universal Fuel Card is accepted at the largest number of gas stations when compared to the Shell and ExxonMobil cards, which includes about 45,000 gas stations (90% of U.S. gas stations). However, out of these 45,000 locations, rewards are only available at 7,600 locations. Although the 76 Universal Fuel Card is lacking locations that participate in its reward program, it offers a wide range of discounts and gas stations that accept the card. If you’re looking for a business card, it’s worth considering a card that offers rewards and discounts at more locations, like the Shell Small Business Fuel Card. We sourced reviews from online and found that users typically say the main drawback to this card is the scarcity of locations that participate in the rewards program. Although there are several national locations (45,000), cardholders complain that only 7,600 give you rewards, and that these cards only work at gas stations owned by the card’s brand. In hindsight, cardholders do like the overall wide network availability. You can apply for the 76 Universal card online in a matter of minutes. All you need to provide is basic personal and business information and you can receive a decision instantly. After you’re approved, you will receive you card within seven to 10 business days. The Chevron Texaco Business Access Fuel Card is best for small businesses that have a fleet of cars that are driven far and often. With this car, you will pay a monthly fee of $2 per card, but will have the opportunity to earn up to $0.06 per gallon. This card acts like a charge card, which is required to be paid in full every month, and therefore doesn’t carry any interest rates. Instead, any unpaid balances will be hit with a minimum $75 late fee. Compared to both the 76 and Shell cards, the Chevron Texaco Business Access Fuel Card acts as a charge card instead of a credit card. There is no 0% introductory APR or ongoing APR for this reason. Any and all unpaid balances are penalized by a late fee versus the typical interest charge. The ongoing fees of the Chevron Texaco Business Access Fuel Card match up pretty evenly with the 76 Universal card with the exception of its late fee. This card has a one-time setup fee for new accounts and a monthly charge of $2 per card. Similar to the 76 Universal card, the Chevron Texaco Business Access Fuel Card is generally a more expensive option due to its setup fee and monthly card fee. Keep in mind, however, that card fees are typically set in place because of the rewards and discount structure they provide for cardholders. For example, for this card, you will have access to cash rebates at the expense of the monthly fee. Compared to the 76 and Shell cards, the Chevron Texaco Business Access Fuel Card is a charge card and is required to be paid in full every month. Since there is no APR because of this reason, any unpaid balances will be charged with a minimum $75 late fee until repaid. The Chevron Texaco Business Access Fuel Card has a rewards program that benefits small business using 500 to 10,000+ gallons per month. Cardholders can earn up to $0.06 per gallon starting at 500 gallons when they fuel up at a Chevron or Texaco station. In contrast to the 76 Universal card, this rewards program is better because you can begin earning rebates at 500 monthly gallons compared to 76’s 1,000 monthly gallons. These gas rebates are not applied at the time of purchase but will appear as an account credit on your monthly statement, which is common among most fuel cards. Typically, Chevron and Texaco will look at your business credit report and business score from Dun & Bradstreet and Experian. These scores range between 0 and 100, and a score of 80+ is considered to be good. This is considered company liability, which protects your personal credit score and personal assets. However, if your business has been in business for three years or less, then you’re required to have joint liability between you and the business. Your personal credit score is then used to qualify you, and you’re required to provide a personal guarantee. This means if the business fails to pay the debt, you become personally liable. We recommend having a score of 640+ when you’re applying (check yours for free). The Chevron Texaco Business Access Fuel Card is accepted at nearly 8,000 Chevron and Texaco stations nationwide, which are available in every state. This card is also accepted at any major U.S. gas station, making it a good option for those small businesses that drive further distances. Keep in mind that you can only earn gas rebates with this card when you use it at a Chevron or Texaco location. The Chevron Texaco Business Access Fuel Card is lacking a larger number of gas stations where cardholders can earn their rewards. There are only about 8,000 locations that participate in this rewards program. However, a good alternative to this would be the Shell Small Business Fuel Card, which offers rewards at 14,000 locations. Online reviews suggest small businesses with company vehicles that prefer to use Chevron and Texaco over other stations especially like this card. Despite its small monthly and one-time setup fee, cardholders love that they can earn gas rebates as early as 500 gallons of gas per month. From all the reviews we sourced online, we found that the only negative aspect of this card was that it’s required to be paid in full every month. If you think you’ll need to carry a balance, its best to consider the Shell Small Business Fuel Card or 76 Universal Fuel Card. You can apply online for a Chevron Texaco Business Access Fuel Card by providing basic business and personal information. After the credit provider runs your business credit score and evaluates it, you will typically receive a decision in two to four business days. Once approved, you card will arrive in the mail within seven to 10 days. The Chevron Texaco Business Fuel Card is best for small businesses that are existing Chevron or Texaco customers and want a card with no fees. This fuel card works like a charge card and therefore doesn’t carry an interest rate. With no monthly, annual, or initial setup fees, small businesses can use this card at nearly 8,000 Chevron and Texaco stations nationwide. This card is an excellent option if you want to avoid fees and control employee spending by setting spending limits through your account. Chevron Texaco Business Fuel Card functions like a charge card, similar to the Chevron Texaco Business Fuel Card. This means this card doesn’t carry an introductory or ongoing APR because it’s required to be paid off every month. 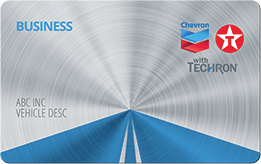 The Chevron Texaco Business Fuel Card is the most affordable option of the two Chevron gas cards on our list. With no monthly, annual, or setup fee, this business gas card matches up pretty evenly with the Shell and ExxonMobil gas cards. 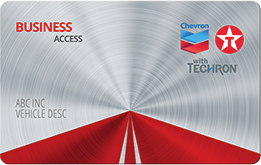 In contrast to the Chevron Texaco Business Access card, the Chevron Texaco Business Fuel Card is the more affordable option. However, it’s important to note that although there are no card fees, this sometimes results in no rewards or discounts. Compared to the Shell Small Business Fuel Card, which can carry balances, the Chevron Texaco Business Fuel Card is required to be paid off in full every month. Instead of penalizing unpaid balances with ongoing interest charges, accounts will be charged a minimum late fee of $75. If you don’t believe you will be able to repay your balance in full, consider the 76 Universal Fuel Card or Shell Small Business Fuel Card. The major downside to this business gas card is its lack of a discounts and rewards program because of its non-existent fees. Most often, fuel cards generally have some sort of incentive program where cardholders can earn discounts when using their card. If you’re looking for a card that offers discounts and that’s accepted at Chevron or Texaco, we recommend considering the Chevron Texaco Business Access Card. The qualifications for both of the Chevron and Texaco small business gas cards are the same. They generally only look at your business credit from Dun & Bradstreet and Experian, and make a decision based on your business credit history. This method of company-only liability protects your personal credit score and personal assets. However, if you’ve only been in business for three years or less, they will require a joint liability application. This means they will use your personal credit score to qualify you and require that you offer a personal guarantee. A personal guarantee means if the business fails to pay off the debt, then you become personally liable. We recommend having a personal credit score of 640+ (check yours for free). The Chevron Texaco Business Fuel Card is only accepted at 8,000 Chevron and Texaco stations in the U.S., which is an extremely limited network availability. That’s only 6% of all gas stations across the United States. When compared to the other cards on our list, like the 76 Universal card and Shell card; this card ranks the worst in this category. If you’re a small business owner looking to earn rewards or discounts on your gas purchases, this card doesn’t fit your needs. Although it’s an affordable option, it doesn’t give any opportunity to earn cash back or rebates. For existing Chevron or Texaco customers, consider their Chevron Texaco Business Access Fuel Card, which offers gas rebates up to $0.06. We sourced reviews from online and found that small business owners with widespread businesses don’t see this to be beneficial because of its small network availability. However, for those existing Chevron or Texaco customers, this is a great, inexpensive option because there is no cost to open the account or add employee cards. You can apply for a Chevron Texaco Business Fuel Card online by providing your basic business and personal information. After you submit your application, the credit provider will need to run and evaluate your business credit. It usually takes about two to four business days for a decision. If you’re approved, you will receive your card within seven to 10 days. The BP Business Solutions Fuel Card is best for larger fleets that want a large network availability and opportunity to earn discounts at BP stations. This fuel card works like a charge card, so it doesn’t carry any interest rates. Instead, it has a minimum late fee of at least $75. If you’re a small business owner looking to earn rewards at BP locations with the flexibility of using your gas card at other branded stations, then this card is right for your business. Similar to the two Chevron Texaco gas cards, the BP Business Solutions card is also a charge card. This means there is no introductory APR nor ongoing APR. Instead, any unpaid balances are penalized by a minimum late fee ($75). The BP Business Solutions gas card has a small monthly account fee, but this can be waived when you purchase 5,000+ gallons per month, unlike the other cards on our list. It’s important to note that this fee is specifically for the account and it’s not a per card cost. You can request and activate as many new cards as you need without any additional costs beyond the $10 account fee. Typically, fuel cards will have some sort of fee if they provide cardholders with discounts or rewards programs. With the discounts you earn on this card, you can earn that $10 account fee back after purchasing 300 gallons in one month. However, some cards, like the Shell Small Business Fuel Card, have no monthly fees and still offer discounts on each gallon ($0.03). Similar to the Chevron Texaco Business Fuel Card, the BP Business Solutions Fuel Card functions as a charge card. This means the outstanding balance at the end of the month is required to be paid in full. Any balances that carry over to the following billing cycle will be hit with a minimum late fee of $75. Business fuel cards that act like a charge card rather than a business credit card aren’t the best options if you think you won’t be able to pay the full balance every month. This can cause many issues with accruing unnecessary late fees. 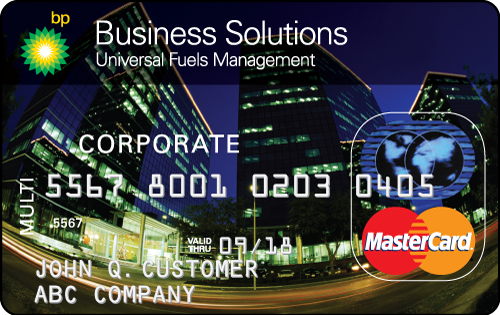 Much like the 76 Universal card, the Business Solutions gas car offers tiered discounts for its cardholders. You can save up to $0.06 per gallon on fuel purchases at BP and ARCO-branded stations nationwide (7,200). Again, when considering a card that offer discounts or rewards, it’s important to consider how many of their stations participate in their rewards program. There are 7,200 BP and ARCO-branded gas stations nationally, and they all accept the rewards program. Conversely, this falls short of Shell’s 14,000 locations that participate in its rewards program. For the Business Solutions card, you will need to be in business for two or more years, have a steady business credit history, and no fraud activity reporting to your business credit. If your business has been in operation for two or more years, your personal credit score and personal assets will be protected. However, joint liability between the business and business owner is required if your business is less than two years old, This means your personal credit score will be taken into account and they will require you to provide a personal guarantee. A personal guarantee means if the company fails to repay the debt, you will become personally liable. We recommend having a personal credit score of 640+ (check yours for free). The BP Business Solutions Fuel Card is accepted at any station that takes Mastercard, which happens to be most major gas stations. However, keep in mind that cardholders can only earn rewards at the 7,200 BP and ARCO-branded stations nationwide. The only other card on our list that ranks well with this is the 76 Universal Fuel card, which is accepted at 45,000 stations nationwide. The BP Business Solutions Fuel Card is missing a wide range of locations that participate in their gas rebates program. There are only 7,200 locations that participate, compared to Shell’s 14,000 locations. Online reviews suggest cardholders love that they can use their card at any major gas station that accepts Mastercard, which is most of them. However, there are a few negative reviews that mention the scarcity of locations around the country that participate in the rebates program. You can apply online for the BP Business Solutions card, which can be done in a few minutes. After providing your basic personal and business information, it usually takes 24 to 48 business hours for them to run your business credit and deliver an approval decision. Once approved, you will receive your card within five to seven days. The ExxonMobil Business Fleet Card is the best alternative to a fuel card and is right for small business owners looking to make gas and vehicle-related purchases. This is an inexpensive alternative option because it carries no monthly or setup fees. This card also acts as a charge card and carries no interest. If you want to earn an introductory reward and ongoing rebates after that, this card is excellent for your fleet. Similar to the BP Business Solutions Fuel Card, the ExxonMobil Business Fleet Card is a charge card, so it doesn’t carry an introductory or regular APR. Instead of accruing interest charges, any balances that are carried over to the next billing cycle will be hit with a late fee. The ExxonMobil Business Fleet Card is similar to the Shell Small Business card in that it has no monthly, annual, or new card fees. There is also no limit to the number of cards you can give out to your employees. It’s important to keep track of employee spending on each card, especially if your fleet has multiple cards. As a business owner, you’ll be held liable for the transactions of your employees and responsible for making timely payments. It’s important to create a corporate credit card policy to help protect yourself and clearly define the expectations you have with your employees. Similar to the BP Business Solutions Fuel Card, the ExxonMobil Business Fleet Card acts as a charge card. This means the balance is due in full on a monthly basis. Any unpaid balances from a billing cycle will be penalized by a minimum late fee of $75. If you’re looking to possibly carry a balance or don’t know if you can pay your balance in full every month, consider a fuel card that acts as a credit card. This will help you avoid any late fees and keep you from falling into a cash trap. A good alternative option to consider would be the Shell Small Business Fuel Card. The ExxonMobil Business Fleet Card is part of tiered discount program, which is similar to the BP and 76 cards. However, with the ExxonMobil fleet card, you can earn rebates for using as little as 0 to 499 gallons of gas per month. In comparison, BP requires you to use at least 300 gallons and 76 requires you to use at least 1,000 gallons to earn your first tier of rewards. The ExxonMobil Business Fleet Card also offers an introductory bonus, which sets it apart from the rest. For the first three months, cardholders can save $0.25 per gallon. After the promotional period ends, cardholders will continue to earn rebates on every gallon you pump at Exxon and Mobil-branded stations. The ExxonMobil Business Fleet Card is similar to the 76 Universal Card in that it requires joint qualification and doesn’t allow for company-only qualification. The Social Security number of the business owner and the business’ Employee Identification Number (EIN) are both required in the application. A personal credit score of 640+ is required for the business owner, and the business credit has to be in good standing in order to be approved. Like the 76 Universal Card, the business owner is jointly liable with the business. This means if the business fails to repay any outstanding balances, the business owner must personally repay the bank. 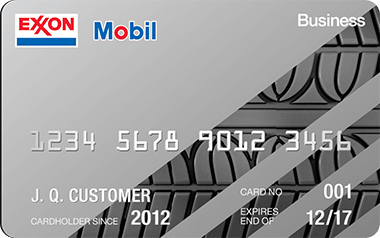 The ExxonMobil Business Fleet Card is accepted at any Exxon or Mobil gas station or service station. There are roughly 10,000 of these locations across the U.S, which is roughly 12% of all national gas stations. The fleet card discount and rewards program is valid at any of these stations. If you need to use your card at non-branded stations, you may want to consider the 76 or BP gas card. Cardholders can’t use the ExxonMobil business card at any stations other than Exxon and Mobile. Companies that are driving far distances may find this to be a roadblock, and should consider a card that can be accepted at more stations, such as the 76 Universal Fuel Card or the BP Business Solutions Fuel Card. We sourced reviews online and in doing so, we found that cardholders like that you can earn gas rebates on your first gas purchases, which separates it from other discount programs. Reviews also suggest that people are generally enticed by the card’s introductory promotional period, because most fuel cards don’t offer that. You can apply for the ExxonMobil Business Fleet Card in a matter of minutes. You will be required to enter basic personal and business information to submit your application for review. Generally, you will hear back within 24 hours and receive your card within seven to 10 days. The best fuel card for small business options allow businesses to manage employee gas expenses while earning rewards on gas-related purchases. If you need access to more capital, then you might need to consider an alternative such as a small business credit card, a prepaid card, or a corporate credit card. Small business credit cards are best for accessing capital if your business has little to no revenue, and they help to build business credit. The best credit cards offer high reward payouts, specific rewards categories, and low introductory and ongoing APRs. However, the card that is right for your business is typically determined by your personal and business situation. Business prepaid cards help manage employee expenses and have fewer qualifications than normal small business credit cards. This is a great option if you want to distribute multiple cards to your employees. However, you shouldn’t use this if you’re in need of additional capital because they must be preloaded with funds. Corporate credit cards are right for growing small businesses with $4 million in annual revenue, good business credit, at least 15 credit card users, and expected annual credit card expenses of $250,000+. Typically, corporate cards have benefits that include financial controls, lower annual fees, cash rebates, enterprise perks, and sometimes no personal liability. Each card we covered in our list of the best fuel cards for small business offer several benefits and features for gas-related purchases. The best business gas card for your business comes down to its monthly cost, where you can use the card, and how much money you can save across your entire account. With that criteria in mind, our overall recommendation for the best fuel card for small business is the Shell Small Business Fuel Card. It’s the best card on this list when comparing its liability options, qualifications, and discounted locations.